Recently I had the opportunity to drive a rented 2015 Kia Sedona LX. Following a car accident where my existing minivan was rear-ended and subsequently declared totaled by my insurance provider, I rented a comparable minivan from Enterprise. Having driven it for over 2 weeks now, I have a fairly good feel for the vehicle. With the LX, the minivan came with power everything, Microsoft UVO infotainment and navigation system are included, but otherwise not the complete range of possibilities offered by Kia for this model (heated / cooled, seats and cupholders, for example, were not present). I'm 5 feet 7 inches tall, and my legs are a bit short, and this seemed to be problematic with the Sedona. Even with the powered driver's seat moved fully forward, my feet could just barely reach the pedals. This wouldn't be a big deal if not for the fact that with the seat so far forward, each time I got in the top of the door frame threatened to knock me in the skull unless I contorted my torso awkwardly. Aside from an annoying creaking noise coming from the rear, ride noise was minimal. Given that the Florida summer is arriving, the front and rear AC were sufficient. The 3.3 L V6 engine and accompanying 6-speed automatic transmission were nicely peppy and responsive. 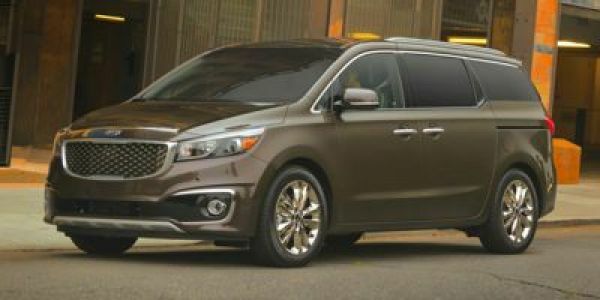 The braking was excellent, and upon glancing at a Consumer Reports review of this model, it appeared to be among the best as far as braking goes for minivans. However, one gripe with the ride is that it's a bit brutally stiff. It reminded me of the last time I'd driven a pickup, and even over fairly minimal potholes the suspension was unforgiving. Handling is a bit ponderous, given the 19-inch wheels and somewhat unrefined steering. The infotainment system is definitely a plus for the Sedona. Navigation is straightforward and simple, and the backup camera is a nice touch. Those of you who use a USB flash drive for your music might be annoyed occasionally, though, as perhaps every 1 out of 3 attempts or so my USB stick chock full of MP3s would need to be reinserted after starting the vehicle after failing to detect the device. Kia, in typical Korean automaker style, has tried valiantly to copy the success of, say, the Toyota Sienna, and although it comes close, it isn't quite there. I think you'd be better off buying a prior year top-of-the-line minivan by Toyota or even Dodge rather than plunking down some $30K+ for this model.